Continuing my efforts to blend music with Fine Art, I bring you another tune from Jonathan Richman, this time singing the virtues of van Gogh. The performance is made ever more poetic with the juxtaposition of John Cale on the sofa, looking a bit too cool in his shades. As with van Gogh’s work, simplicity and honesty prevails. OLDERHappy Chinese New Year! 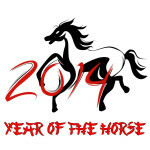 The Year of the Horse (馬 午).